Cass alumna reflects on her career and entrepreneurship. 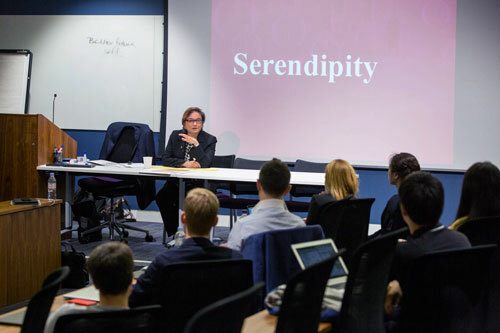 Cass was delighted to welcome alumna Neeta Patel (MBA, 1995) to speak at the New Venture Creation programme in London. She spoke candidly about the highs and lows she faced in an extensive career spanning financial services, media & publishing, education, arts and the creative industries. Neeta is an experienced executive with over 20 years of strategy and operational leadership experience in launching new ventures, business turnarounds and change and has a sharp focus on growth and revenues. She was an early internet pioneer having launched the first personal finance website in Europe for Legal & General in 1996 at a time when there were only 300 URLs registered in the UK. Prior to joining the New Entrepreneurs Foundation, Neeta worked in Private Equity matching technology entrepreneurs with investors. Neeta has held senior positions at Thomson Financial (Reuters), Legal & General PLC, Financial Times Group and at the British Council. The New Venture Creation programme has been designed to equip nascent entrepreneurs with the skills necessary to start a scalable business. Highly experiential in nature, the programme is normally offered as part of an Executive MBA course at Cass, which is now open for external applicants to attend. Click here for more information about the New Venture Creation programme.